Bottle cap pendants and charms made easy! 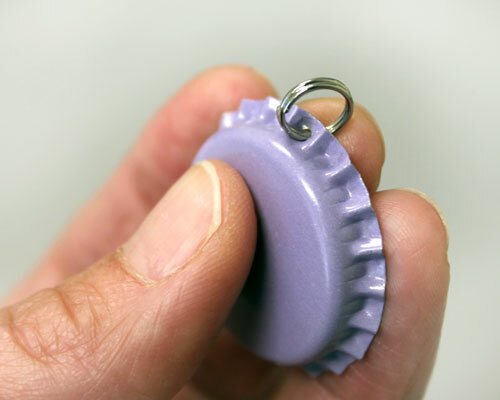 energy saving tool for attaching a split ring to a bottle cap. 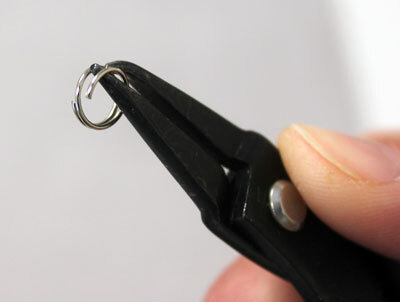 Prepare your bottle cap for the split ring by punching a 1/16 inch hole in the rim. the coil - lightly squeeze the handles together. Twist the tool into the coil so that the straight end is holding the coil open. Grab your cap and slip the start of the coil onto the cap. 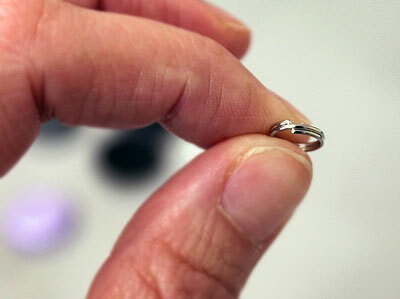 Remove the tool from the split ring and reposition it on the ring as shown. 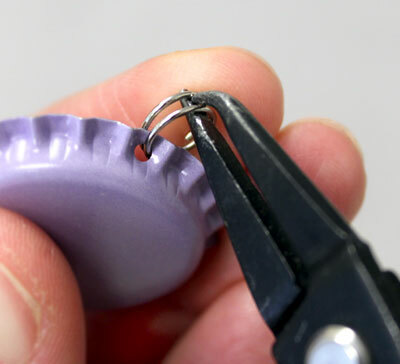 Squeeze your tool and turn counter clockwise while applying slight upward pressure on the ring in order to twist the coil onto your bottle cap. 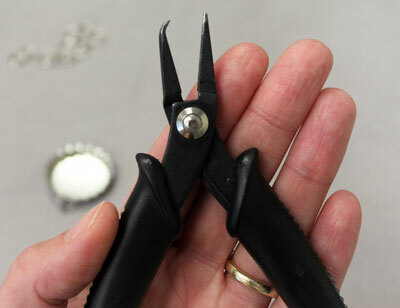 This part takes just a bit of practice to get the feel, but in a short time you'll be saving money by creating your own bottle cap pendants and charms. TA DA! Your very own bottle cap pendant. Ready for a beautiful design! very informative!!! 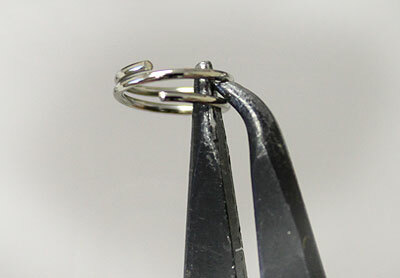 I have always wondered if there was an easier way for split rings! Thank you for the great comment Jennie! 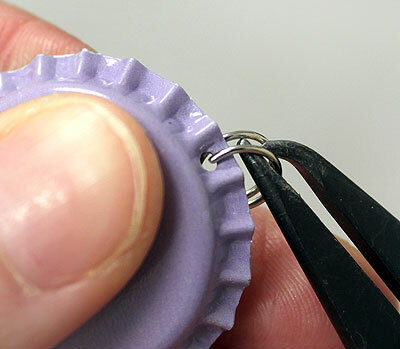 Can the 1/16" hole punch be used on the mini bottle caps or is it too big? Hi Devan, That's a great question! 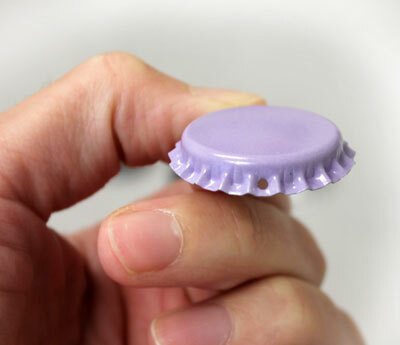 The 1/16" Hole Punch can be used on any of our bottle caps that we use. So it will definitely work great with the mini caps. Hello! What does it mean if you get a "jagged" hole when you use the bottle cap punch? The tool is brand new. Thank-you!! Cheryl, if your hole is jagged you might want to replace the punch pin. You're using a 1/16 hole punch right? Im trying to connect bottle caps in a sort of rectangle for a curtain to hand over my sink standard rod, what tool is it called metal 1 16th punch where do i get it. Holes have to b even two at top and two at sides to attach to each otherso they dont. Spin. What do i attach them with regular jump rings but what size. Help please. Cant find a good video how to on this.